We are a family of animal lovers, that’s for sure! When I was a kid we had a number of yard dogs. (Mother wouldn’t tolerate a dog in the house.) My favorites were a collie named Sheba (seen on the “Parenting Your Parents” post) and a mix that was at least part setter (his name was Trouble, and that says it all! Mother said neighbors would call and ask her, “Are you looking for Trouble?” Ha!). We tried taking one of my cousin’s cats home once. ONCE! She got out of the box in the back seat of the car, leapt onto my Dad’s shoulder, and dug her claws through his sports coat (drawing blood). We promptly turned around and took her back “home”. My folks were not very fond of cats anyway. Ed’s family had a number of much-loved dogs over the years, but they were REALLY cat lovers. When I first went to visit his family, they were living in the apartment over his dad’s boatyard on the Kemah waterfront. [Have you seen that area lately? Incredible tourist mecca where Jimmy Walker's and the Clear Creek Inn used to be! Joe’s Crab Shack covers the exact property where the Davis Boatyard stood.] Anyway, his family had 42 cats. Now cats are a must for a boatyard, but naming, feeding, and treating 42 cats as pets is a bit much! With this background it was only natural that when we married and got out on our own we would share our lives with a variety of pets. 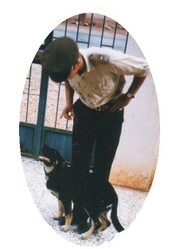 In Benghazi we had a Black Alsatian Shepherd, a beautiful dog. When we left we gave her to an officer at the British Army Garrison (situated just behind our compound). Back in Houston a student gave us a cocker/poodle mix who lived with us for 16 years, moving with us from Houston to Indiana, and then to Wyoming. In Indiana we lived on several acres of beautiful hilly, wooded land situated between and amongst a number of farms. We had a lot of cats while living there, to offset our fair share of mousies that roamed the cornfields and surrounding areas. 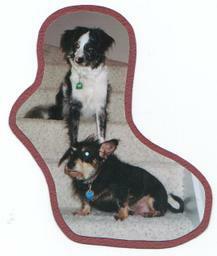 We also had a beloved Cairn Terrier (like Toto in the Wizard of Oz) for a number of years while living in Wyoming. My favorite memory of her is that she was the mediator of mother and son when “WE” were going through puberty. For an unbearable stretch of time the only comfortable communications we had were when we both sat on the floor and played with the dog. I was very grateful for that means of breaking down barriers and sharing love and laughter, if only for a brief time. It let me know things would be good again between us – and they are! We have not had a pet living in our house full time for a number of years now. Fortunately, however, our grand-dogs come to see us regularly. Our kids feel blessed to have resident doggie care, and we feel blessed to have these hooligans fill that particular hole in our home occasionally. Rocky (the ersatz Australian sheep dog) and George (who knows what he is!?!?!?) were rescued by Matt and Megan from the Fuzzy Friends Animal Shelter. I think they look for the dogs least likely to be chosen and fall in love immediately. [Upon reading this Megan remarked, "I think someone would have chosen Rocky, but George is another matter!" 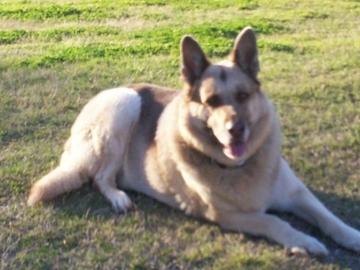 I agree, Rocky really is a beautiful dog - silky fur and perfectly porportioned body!] And it is amazing to see how good these dogs are with our 15 month old grandson. I think they know they owe a debt of gratitude to their folks. Even before the baby came, we traveled to Dallas occasionally just to babysit Rocky and George. Now our main motive for the trip is that we want to spend time with Alex – but don’t tell the dogs that! They think we go to Dallas just to see them, and they come to see us in Waco for special occasions, too. 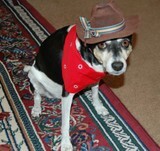 But what about the cute Rat Terrier pictured in her cowgirl garb at the first of this post? 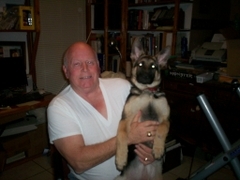 That's Nike, and when I first published this post she was the beloved pet of son Jonathan, wife Jennifer, and grandsons Tyler and Ryan. She had been in the family since before the boys were born and really was a part of the family in every way. She stayed at the Davis Spa frequently and was very attached to Ed. In fact, when Jonathan and Jennifer came to get her after a trip she would hide so she wouldn’t have to leave our house. Unfortunately, Nike is no longer with us and we have all grieved her departure. After a few months the kids visited Fuzzy Friends Animal Shelter and found a new friend, a mistreated dachsund who is several years old and is fast becoming a beloved pet (and much less traumatized, now that the bullet hole on his face has been repaired). He goes by the name of Gus. You can tell by the first picture of the post that he has become the patriarch of the Waco Davis family. I’m guessing many of you have a lot of good memories about the pampered pooches and coddled cats that have filled your lives. Perhaps you have a beloved pet who is your companion now. Please send me photos with your comments (by e-mail) so I can add them to this post. Or make a comment below. And if your pet is a bird, a fish, a horse, whatever – all are welcome here!!!
. 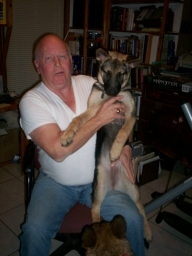 . . March 12, 2008 John Echoff sent the following photos and commentary about the pooches that inhabit his world. 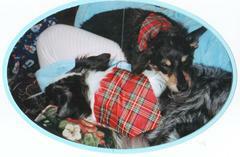 Thought I'd pass on a couple of pix of two of our pampered pets. "Tasha" is our newest family member. She will be 5 months old next Monday (March 17th). The other guy is "Oskar" he is 8 years old and King of the house. We've had Oskar since he was 9 days old and Linn had to hand feed him every 2 hrs until he was old enough to eat on his own. Looks like he eats pretty well, eh? He has been on a diet for about a month and now is down to 112lbs. About this photo, John wrote, "Skipper is a dog I had as a child while still living in Manchester. He caught rabies, bit me and I had to take 21 shots in the stomach. Tyke was the first dog I had as an adult. He looked like a miniature border collie. He was my fishing buddy. Whenever I caught a fish, he would swim out and nip at the fish's tail until I landed it. 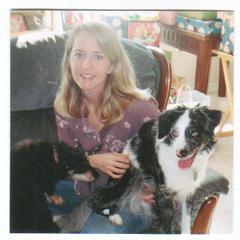 My deepest sympathies on the loss of your beloved family member. Just remember that dog spelled backward is GOD, and I don't believe that is a coincidence! I miss Nike but love Gus. Gus is such a good dog eneyone would love him. Tyler: As your Grampa, I know how much you and your family loved Nike. And you know I loved her, too. Now I am glad we all have Gus to love - he is a great dog for sure. I did not mention previously that when the kids got Gus (see photo of Gus with grandson Tyler, above) he had a hole in the side of his muzzle. Best anyone can tell, he had been shot in the face, although it could have been a birth defect. The hole was visible from the outside, but the edges were nicely "healed over" so it just looked strange, not gross. However, the problem was that the hole went through and opened up inside his mouth. Food would lodge in the hole and clog the opening, then spoil there, so that he was always open to infection. And sometimes, THAT did look gross.